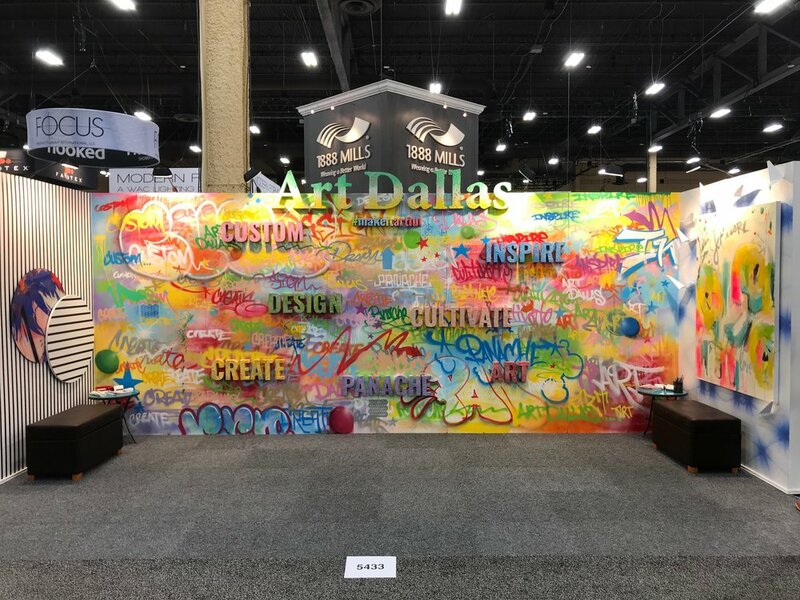 ART DALLAS ATTENDED HD EXPO 2018! Thank you so much for stopping by the Art Dallas booth #5433. We feature services in an open format inviting each expo visitor in to see wall murals, original artwork, handcrafted sculptures, beautiful frames, and large-scale fine art prints with a variation of materials created in-house at Art Dallas Inc.
HD Expo is the industry’s leading hospitality conference and trade show. Presented by Hospitality Design magazine, it offers an unmatched level of new products and services, inspiration, idea-sharing and networking for hospitality professionals. We were thrilled that the Art Dallas booth was booming all three days of the event in Las Vegas. A big thank you to all the industry professionals we could connect with and share our love for making it artful! Art Dallas commissioned this graffiti wall, created by a Dallas artist well known for his graffiti work locally. The letters were routed out of wood to stand out from the rest of the booth. Customize, design, create; these are all things Art Dallas does in-house. Our mission is to encourage and promote creative artistic expression both locally and throughout the world. We utilize the finest materials and designs to manufacture custom artwork and accessories in collaboration with the finest contemporary artists. Art Dallas has worked with Acrylics for the better part of 3 decades! Acrylics in an Art Dallas framer's hand can be used in several beautiful ways. As a framing option, acrylic makes a major statement while staying classic. Printing on acrylic creates a new way to view a fine art print; the colors come out incredibly vibrant and it makes for a truly unique piece. Displaying your precious items is a solution to shadowboxes, where you may miss all sides of your treasures. The Art Dallas Gallery carries over 300 artists' works in-house. This gorgeous original on canvas has a resin top layer that gives it that unique shine. Art Dallas maintains a large inventory in the gallery, including original art, prints, and sculptures. Art Dallas fosters relationships with many art publishers, and clients also have access to Art Dallas local, national, and internationally affiliated artists to produce commissioned pieces. Another key feature of the booth this year was the giant mural on the outside of the booth! We loved the bright colors of this beautiful work. The work was scaled to roughly 5 feet by 10 feet. These works were created by a local Dallas artist and then printed on a large scale in the Art Dallas print shop! Vinyl murals provide a lasting and timeless look in addition to, or in-lieu-of, traditional media. Art Dallas vinyl murals are fully customize-able, allowing for the client’s imagination to be fully developed into a lasting impression. At Art Dallas, wall murals come in every look you can think of, from classic, neutral, or minimalistic, to bohemian, bold, and artsy. Digital printing has enabled revolutionary changes, bringing murals up-to-date with exciting designs. Unlimited color palettes are available and there are no restrictions when it comes to pattern size, resulting in designs that are big and brilliantly vibrant. Get exclusive offers, new product information, installation views, and invitations to events at Trinity West Fine Art directly in your mailbox. Art Upgrades for your well loved works.